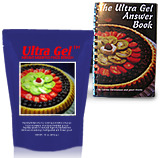 16 oz Ultra Gel with Ultra Gel Answer Book--Free Shipping!! !!SPECIAL!! Great deal on a starter pack of a 16 oz Ultra Gel with an Ultra Gel Cookbook complete with free shipping in the continenal US!